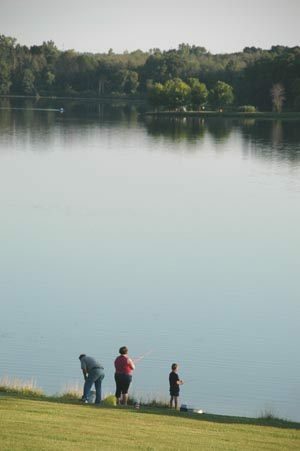 The park considers the Red Trail Loop to be a 1.8-mile, one-way route from Meadow Ridge Shelter on Big Seven Lake to the Dickinson Boat Launch. But a more logical hike would be to continue on the Green Trail Loop a short distance and then depart at post No. 8 to skirt the south end of Big Seven Lake, looping back to the picnic area and beach along its west shore.This would be a 3.8-mile hike that would eliminate any backtracking while skirting the parks three-largest lakes and covering some of the most scenic sections of its trail system. 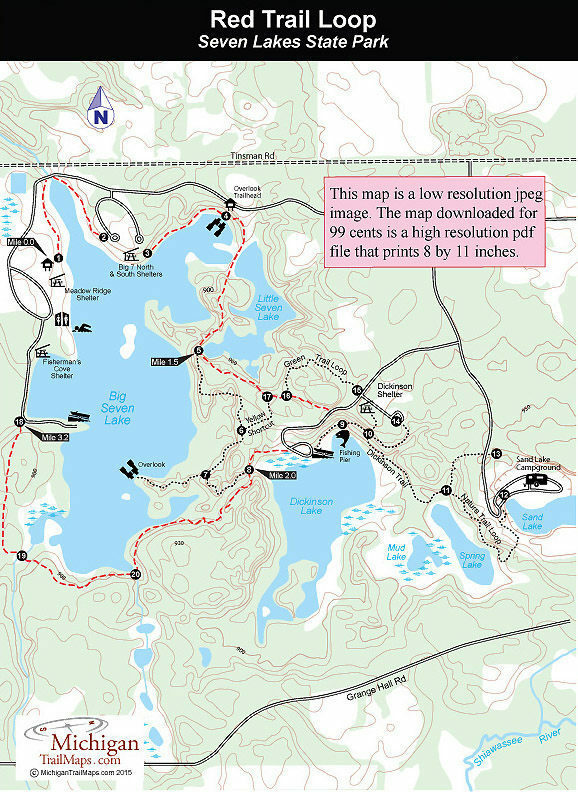 The park considers the Red Trail Loop to be a 1.8-mile, one-way route from Meadow Ridge Shelter on Big Seven Lake to the Dickinson Boat Launch. But a more logical hike would be to continue on the Green Trail Loop a short distance and then depart at post No. 8 to skirt the south end of Big Seven Lake, looping back to the picnic area and beach along its west shore. This would be a 3.8-mile hike that would eliminate any backtracking while skirting the park’s three-largest lakes and covering some of the most scenic sections of its trail system. The trailhead for the Red Trail Loop is post No. 1 near the Meadow Ridge Shelter on the west side of Big Seven Lake. From there it heads north along an open grassy shoreline with views of the park’s largest lake. Within a quarter of a mile you dip to the park road to cross a dam and small stream and then return to the foot path, arriving at post No. 2 in a picnic area. At the Big Seven North Shelter the trail is marked by post No. 3 and enters the woods and then climbs a ridge before popping out at the Overlook parking lot. Located here is a bench with a view of the lake and interpretive display on the state park. The trail descends a grassy slope to the east and soon you’re crossing the spillway and earthen dam hat separates Big Seven Lake and Little Seven Lake. There are views of water on both sides of you while straight ahead you can see where the trail re-enters the woods. At Mile 1.5 you arrive at post No. 5 where the Red Trail Loop merges with the Green Trail Loop at the south end of Little Seven Lake. Head east (left) and within a quarter mile you’ll be at post No. 16 where the Red Trail Loop splits off south (right) to quickly reach the boat launch. To continue around Big Seven Lake pick up the Green Trail Loop and follow it west a quarter mile from the boat launch parking lot. At post No. 8 head south (left) as the trail skirts the south end of the lake. You move from tracts of mature hardwoods to second growth forests and cross a pair of small streams, marked by posts, before breaking out at post No. 18 near the park road on the west side of the lake at Mile 3.2. Head north (left) to follow the park road to the large beach and day-use area and then cut through it to return to Meadow Ridge Shelter.